Office kitchens aren’t exactly known for inspiring culinary sophistication, but it’s still possible to put together something tasty with only a microwave, assorted plasticware, a little advance preparation, and some gumption. Now, step away from the vending machine. Be a break-room gourmand with an assortment of microwaveable risotto dishes. Keep some risotto (or Arborio) rice and vegetable stock on hand in your office fridge, and for healthy additions, start by bringing in a rotating selection of mushrooms, asparagus and lemon, butternut squash, or peas. Prep your fruits and veggies at home beforehand, and this easy dish is just a matter of nuking a sweet potato for 10-20 minutes (depending on the size). Split the potato and add the tuna, sliced onion, red chilis, and a squeeze of lime juice and dollop of Greek yogurt. If you’re not one for tuna-on-taters, substitute feta cheese for a healthy, savory option. 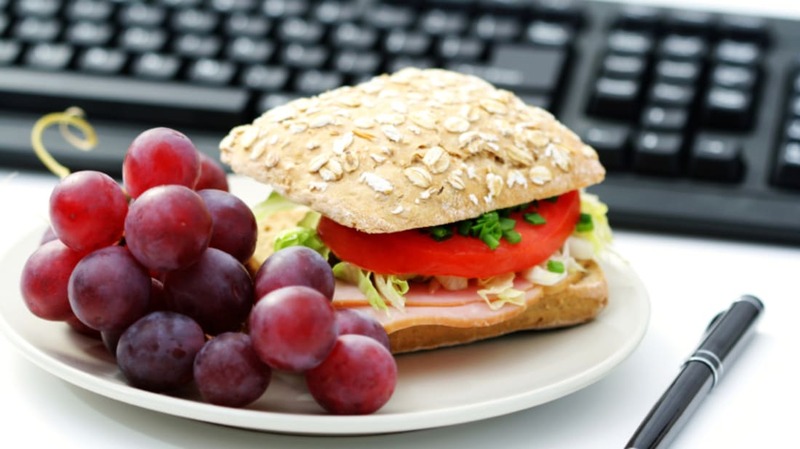 No one wants to bring a soggy sandwich to the office, but prepping one in the break room will give you a fresh meal in just a couple of minutes. While microwaving bacon, start stacking the lettuce and tomato on thick-sliced bread. Season with salt and pepper or add mayo, and pop your newly crisped bacon on top. Thank goodness for pre-cooked rotisserie chicken at the local market! Toss shredded chicken in a bowl with your favorite barbecue sauce (which you can store in the fridge with your bottle of balsamic dressing for salad days), add pickled jalapeños, and you have the makings of a filling sandwich. No cooking required. This recipe sounds fancy, but it’s fairly easy to put together (and requires very little clean up if you eat the salad directly out of your mixing bowl rather than returning to the avocado shell). Halve and scoop out avocados, dicing the flesh. Toss the diced avocado with mini balls of mozzarella, cherry tomatoes, and dress with a splash of vinegar and olive oil for a bright, summery dish when you’re stuck eating inside the office. Courtesy of Real Simple, this simple meat and cheese wrap gets jazzed up courtesy of a cream cheese and horseradish spread. Just add lettuce and roll all the ingredients into a tortilla for a quick and tangy alternative to that standard roast beef sandwich you usually grab from the deli. This breakfast sandwich can either be for those mornings you don't eat until you're at your desk, or it can also serve as a protein-packed lunch. Stick two eggs mixed with water in the microwave for one minute, which will create a fluffy, scrambled egg. Add cheddar and sliced avocado—or try pesto and ham—and enjoy on a roll or biscuit. Leave PB&Js to the kids and whip up this quick tuna and pesto sandwich instead. Drain a can of tuna and mix it with store-bought pesto, add pepper and any veggies you might have remembered from home, and spread on bread for a gourmet-level sandwich that is under 200 calories. Everything goes with peanut butter, of course. If you’re the type to run out the door without eating breakfast, this simple peanut butter, granola, banana, and honey wrap is easy to put together in the break room in between sips (or gulps) of coffee. Single-serving mac and cheese is well within reach thanks to your the office kitchen’s handy microwave. Put down the Kraft Easy Mac—you can do it all yourself with noodles, shredded cheese, water, salt, and a little bit of milk. You can also dress it up by adding leftover veggies, shredded meat, or salsa. Pre-cooked, frozen rice is the key to this microwavable burrito bowl from Healthy Liv, which is quick and easy, and also highly customizable. Beans, salsa, with cheese or without, avocados—you can add whatever you feel like. Go ahead, throw packets of hot sauce in there. You can't screw this one up.